Come aboard the beautiful 40' catamaran, Ho'o Nanea, and snorkel in the clear tropical water near famous Waimea Bay. Adventure into an underwater paradise. Experience the living reefs and thousands of species of fish and other marine life. Snorkeling Hawaii allows our visitors to experience the natural wonder of Hawaii's warm waters, in a safe and educational environment. An adventure into an underwater paradise of the North Shore. Our snorkeling trips combine the best of both worlds - a scenic sail along the North Shore Hawaii with dolphin and turtle sightings and snorkeling in an underwater reserve. The warm Hawaiian waters will embrace you as you explore the sea life in our snorkeling Hawaii tour. All that exercise works up quite an appetite! After your snorkeling Hawaii water time, climb back on board the comfortable vessel for a delicious deli lunch. Hawaii sailing is truly as good as it gets. On the 9 am to 1 pm snorkeling tour only, enjoy a delicious lunch, a cold drink and the warm Hawaiian sun as you watch the dolphins jump from our comfortable Hawaii sailing boat. Complimentary non-alcoholic beverages are included. You are welcome to bring your own alcoholic beverages. The crew and captain will check the identification of individuals with alcoholic beverages. All children ages 4 and under must wear life jackets and be held at all times. Accompanying adults must also wear life jackets. Please note all sails are weather permitting. Sailing, snorkeling, whale watching and dolphin spotting are all seasonal activities and cannot be guaranteed. If you have a tendency to get seasick easily, take a sea sickness preventative at least one hour prior to the sail. Even tied to the dock our 40 foot catamaran the Ho'o Nanea looks sleek and fast. Ho'o Nanea means "to pass the time in ease and comfort." This is a perfect name for our vessel as she is a dream to sail. The ancient Hawaiians sailed to Hawaii from Tahiti on catamarans and ever since these multihulled boats have proven to be perfect for Hawaiian waters. Our brisk Hawaiian tradewinds keep the sailing exciting! Just because our boat is comfortable doesn't mean she is boring. Depending on how much fun you want to have, you can either ride up forward on the net for a wet and wild time, or move back to the deck, where you can stay dry but still feel the wind in your hair as we ride the waves. On the days when the wind doesn't blow we use our very quiet and efficient motors to propel us across the ocean. It is not the same thrill of being driven by the wind but it gets the job done and there is no such thing as a bad day on the water with us! Captain Don is the full time captain on the Ho'o Nanea. Finding some one who loves their job more than Don just might be impossible! Don came to the North Shore from Huntington Beach, California in 1977 and, as he puts it, "is still on his two week vacation!" This is one guy who does not watch the clock or count the days till his day off. In fact most of the time he seems to be having just as much fun as his guests. Where do you sail from and where do you go? How far is Haleiwa from Waikiki? What time of year can I expect to see whales in Hawaii? Do you have Hawaii snorkeling tours all year round? What kind of experience do I need for a snorkeling or whale watching tour? Is Hawaii sailing on a catamaran different than traditional sailing? What sort of marine life can I expect to see while snorkeling or sailing? Can I bring my children with me on my sailing trip? Do you provide lunch and beverages? What should I bring on my Hawaii sailing, whale watching or snorkeling tour? Can I get seasick during your sailing trips? Can I charter the whole boat? You can book online or call us directly at (808) 371-0432 and we will book your tour and answer all you questions. Where can we rent underwater cameras, wetsuits and prescription masks? Is there anything else to do in the area for those in my party that are not going on the boat? 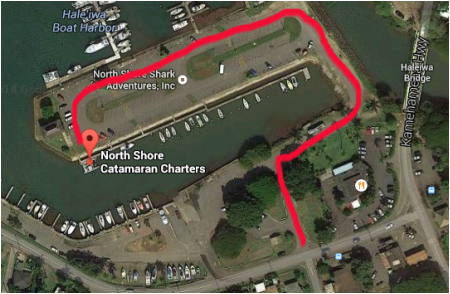 located in the Haleiwa Boat Harbor. The check-in will be in front of the two story grey building pictured below. For GPS, we recommend using Haleiwa Joe’s Seafood Grill. 66-011 Kamehameha Highway. Haleiwa, HI 96712.